TCB-LA’s recent visit to World Travel Market (WTM) was very positive. The B2B trade show with a professional platform allowed Bonaire to meet and conduct business with important tour operators. With previous appointments on the agenda, TCB-LA met with them at BRAZTOA’s (Brazilian Tour Operators association) Pavilion. The tour operators received the WTM Special from Bonaire’s hotels. They were pleased to see Bonaire visiting WTM promoting Bonaire as a leisure and soft adventure destination. In between meetings, TCB-LA was able to visit the different pavilions at the show, including the Aruba Booth. 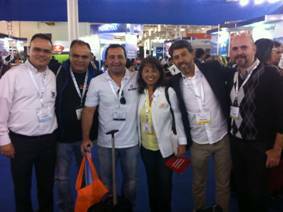 Representatives from Insel Air were exhibiting at the Aruba Booth to promote the new Manaus flight. 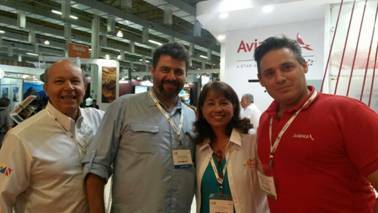 Another very important visit was at the Avianca booth, where TCB-LA met with the Airlines Commercial Director. WTM is the must-attend marketplace for anyone involved in the Latin American travel industry. In 2014 it had an overall attendance of 15,055 visitors generating $341 million of new business. The new official figures for 2015 will be coming out soon.